Leddar™ is LeddarTech’s proprietary LiDAR technology. Leddar provides advanced LiDAR signal acquisition and processing to deliver significant and distinct cost and performance advantages to the automotive and mobility market. It is light signal digitization and signal processing technology that expands the sampling rate and time resolution, recovers distance, reflectivity, and quality information of objects. Leddar provides reliable detection and ranging through mitigation of interference, environmental conditions, and other limiting conditions intrinsic to LiDAR sensors. Leddar technology is at the core of our LiDAR Platform and is covered by more than 70 patents (granted or pending). The technology stems from more than a decade of Research & Development work, led by leading engineers and scientists in the field. It has been validated and optimized through various commercial deployments and 24/7 operation in challenging outdoor environments. LeddarTech’s patented signal acquisition and processing, Leddar technology, generate a cleaner signal that enables lower detection thresholds for significantly increased range and sensitivity over other solid-state LiDAR methods. The result is a discrete time-signal that is analyzed, with distances being calculated for every object utilizing sophisticated software algorithms. 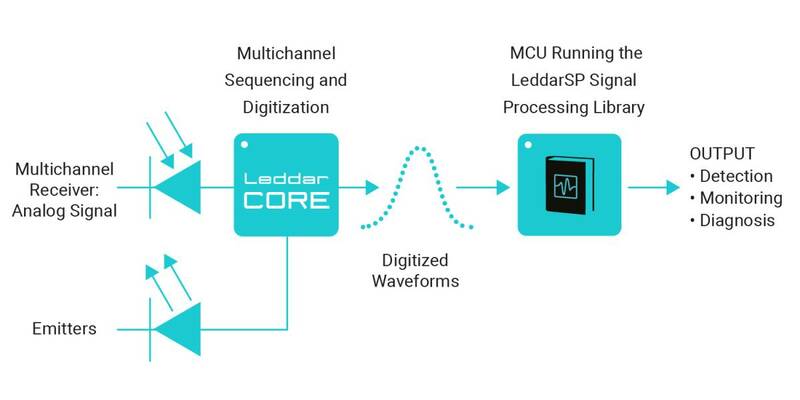 Leveraging affordable components and designed with no moving parts, Leddar-based sensors are perfect for large-scale production and deployment. Leddar’s cleaner, digitalized signal enables detection of weaker signals for significantly increased range using existing technology/components. Leddar technology provides high adaptability of sensors in any environmental conditions. Detection segments provide complete sensing of the environment and better long-range object detection, classification, and tracking- with fewer data compared to point-based methods. Leddar technology’s high resilience to interference means safer, reliable sensor solutions to meet stringent mobility requirements. Reducing the costs of LiDARs to meet commercial deployment requirements without compromising on the performance delivered is a challenge. In essence, the choice of technology and components used often have a direct impact on LiDAR sensor performance. Furthermore, increasing the light output power of a specific LiDAR design to increase the effective range generally comes with a higher price tag. There is quite a bit that can be done to optimize LiDAR performance from a software perspective. More sensitivity and range can be achieved through highly efficient digital signal-processing algorithms, enabling leading LiDAR providers to reduce the overall cost of their solutions or enhance the performance of a given design. Leddar Technology brings significant innovation and new possibilities for LiDAR through its software design. It also means Leddar is unattached to a specific mechanical design or optical technology, making Leddar a key enabler for any time-of-flight LiDAR. Therefore, Leddar is the technology of choice to enhance the performance-to-cost ratio of various LIDAR designs today serving the auto and mobility markets. with a scalable roadmap to support the future evolution and requirements of LiDAR Technologies. Have a question about Leddar technology or Leddar sensors? An expert from LeddarTech will be happy to discuss it with you.